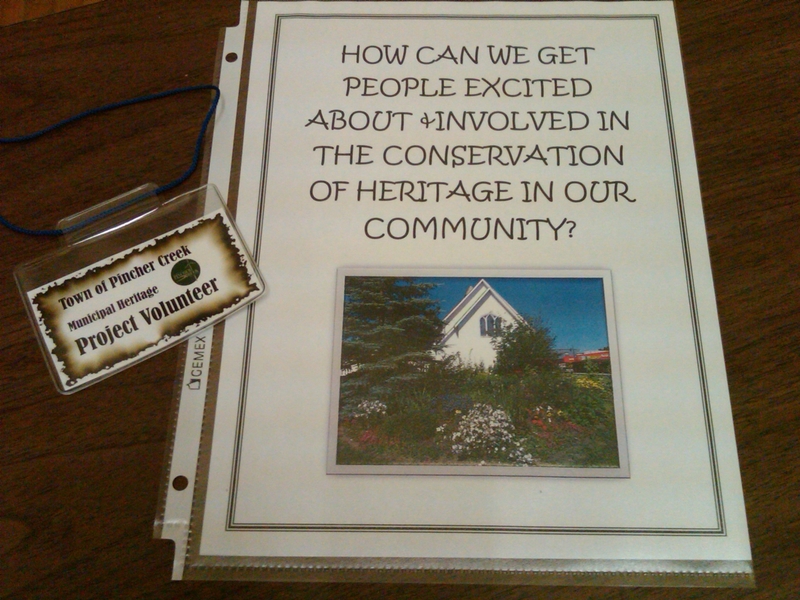 At the end of April I attended an open house for the Town of Pincher Creek Municipal Heritage Survey project. Over the past year, the Town, through the dedicated assistance of community volunteers and the guidance of Farley Wuth at the Kootenai Brown Pioneer Village, has been working on documenting up to 300 sites. These sites, all older than the 1940s, include residential, commercial and industrial properties. The sites are being documented through photography and by recording geographical, architectural and historical information. Once complete, all documented sites may be viewed on the Provincial Heritage Survey database. The open house was attended by project volunteers and interested community members. Their interest in the project was inspiring. With each documented property, the volunteers uncover new facts about their community. Who lived where, and when? Which properties contain unique architectural features? How did the properties evolve after alterations and repairs? With each discovery, a greater sense of community pride seems to emerge. Essentially, a Municipal Heritage Survey is an information gathering exercise, which enables future decisions and projects associated with potential historic places. Properties documented through a survey are not placed under any restrictions. To learn more about the Pincher Creek Municipal Heritage Survey project, click here. To learn how the Town of Pincher Creek is completing this project, please visit the Municipal Heritage Partnership Program website. 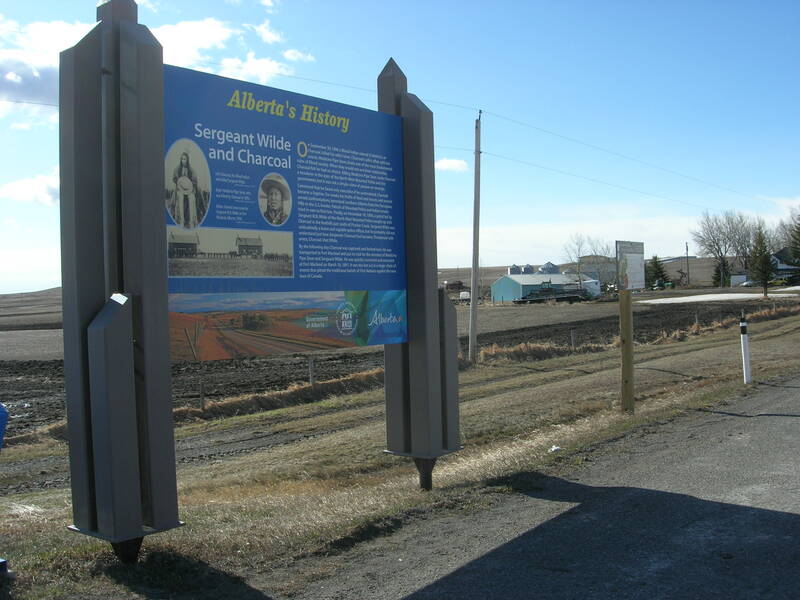 You have all probably seen them – large blue heritage markers located at highway rest areas or points of interest throughout Alberta. These interpretive signs tell of Alberta’s rich heritage. Have you ever stopped to read one? At the end of April I was attending meetings in the Town of Pincher Creek and came across a heritage marker telling the story of Sergeant Wilde and Charcoal. I stopped, curious to learn about an aspect of Alberta’s history. With camera in hand, I decided to also produce an impromptu video blog post. Please watch and enjoy (but bare in mind that my videography skills require some fine tuning). Heritage marker location: east side of Highway 6, four kilometers south of the Town of Pincher Creek. Throughout the next twelve months the Town of Pincher Creek will be completing a Municipal Heritage Survey. Approximately 300 sites (older than the 1940s) ranging from houses, commercial buildings and industrial sites will be documented through photography and by recording geographical, architectural and historical information. Diane Burt Stuckey, Director of Community Services, will serve as the Municipal Coordinator and Farley Wuth, Curator of the Kootenai Brown Pioneer Village, will be the Heritage Consultant. Working together, Diane and Farley will coordinate the volunteer efforts of community residents interested in contributing to this project. These volunteers will photograph each site, conduct historical research, upload information to the Alberta Heritage Survey Program database and most importantly, gain a greater understanding and appreciation for the unique history that provides Pincher Creek with its strong community identity and sense of place. On April 27, 2011, a public information meeting was held for area residents interested in learning about the project. Attendees exhibited an interest in the project and a passion for their community. On May 14, 2011, Brenda Manweiler, Municipal Heritage Services Officer, and Dorothy Field, Heritage Survey Program Coordinator, provided a detailed training session so that volunteers would understand their roles and responsibilities. With camaraderie and commitment, the attendees were excited to begin work. The Philips House will likely be documented in the Town of Pincher Creek Municipal Heritage Survey. 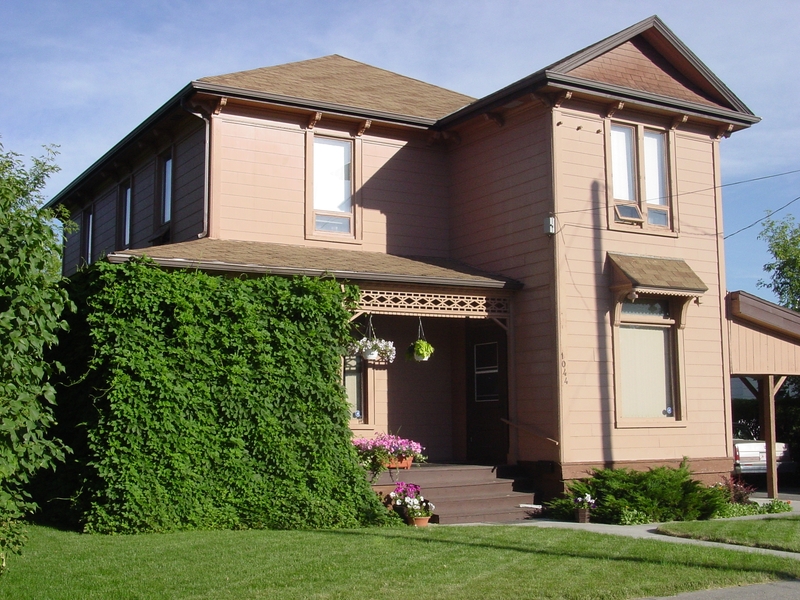 To offset costs associated with the Municipal Heritage Survey, cost-shared funding assistance was provided by the Alberta Historical Resources Foundation via the Municipal Heritage Partnership Program.